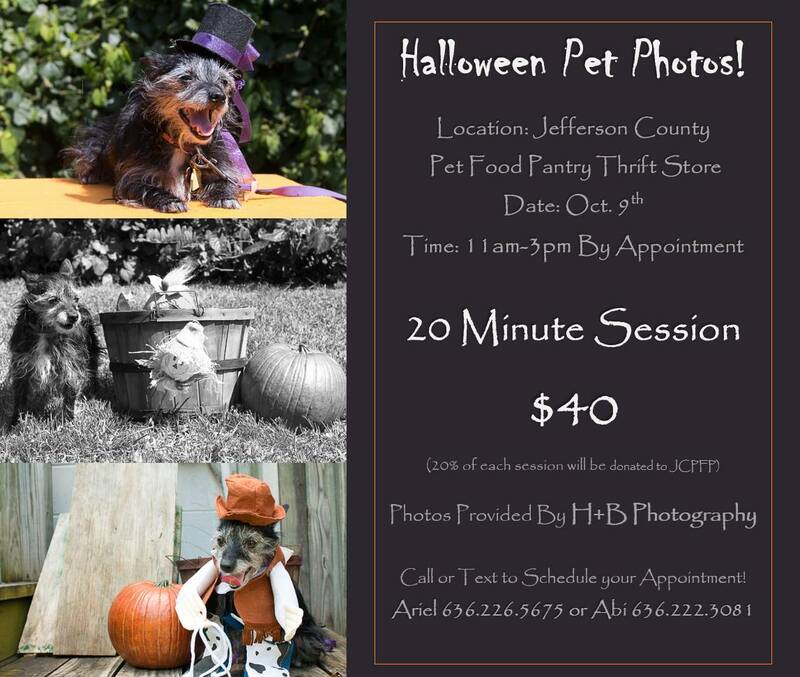 Jefferson County Pet Food Pantry : There are still a few more time slots for our Pet Photo Session 10/9!! There are still a few more time slots for our Pet Photo Session 10/9!! SUNDAY!! Still a few slots left! Pet photo shoot by H+B Photography, appointment only. 20 minute session for $40.00, 20% of proceeds will go to JCPFP. Call Ariel 636-226-5675 or Abi 636-222-3081 for appointment. You and your family can join in the pictures as well, just as long as there is a pet in the picture! 11 -3 Sunday, Oct. 9th @ Jefferson County Pet Food Pantry. 5702 Old HWY 21 (Old State Route 21), Imperial MO 63052. South of HWY M in the Otto Plaza next to Jefferson County Music, across from Dollar General. We will provide pet costumes and props or you can bring your own. Costumes will be available for sale as well. The Thrift Store will be open during these hours so you can shop with (or without) your pet. All sales from the thrift store go to help us feed, spay and neuter pets of low income Jefferson County residents.